Growth and Development in Stephen Chbosky’s [The Perks of Being a Wallflower] – Angel Daniel Matos, Ph.D. I remember the first time that I held that bright green cover in my hands early in the morning during the Christmas of 2002. In all honesty, I had no concrete clue of what the novel was about. 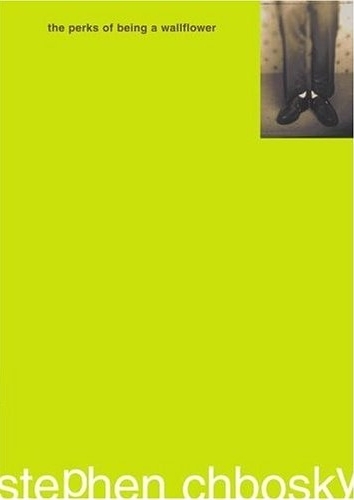 I just remember surfing through the web, looking for young adult books to get me through the holidays, and the title of this novel caught my attention: The Perks of Being a Wallflower. Now, it was an unusually complex title for a young adult novel, but seeing as I myself felt like a wallflower at times, something about the title spoke to me. Little did I know that I was about to read the book that led to a shift in my being… a book that affected me on levels beyond comprehension… a book that almost 14 years later continues to shape who I am. When people ask me what is my favorite text of all time, they would probably expect me to say something that any other literary scholar would say: Shakespeare’s dramas, Milton’s poetry, Dickens’ novels, or maybe even Thoreau’s philosophies and discussions. However, my answer would undoubtedly be the aforementioned book titled Perks of Being a Wallflower, written by Stephen Chbosky. Sure, the book is not a book for everyone. Many people become “nauseated” with the protagonist’s overly sentimental musings, and others simply get angry with the protagonist’s lack of action (these were reactions that some of my past students had when first reading the novel). Others accuse the book of being a rip-off of J.D. Salinger’s The Catcher in the Rye; true, it is unsurprising to see that Salinger’s text was indeed an influence for Chbosky’s work (it is even one of the many novels that the protagonist encounters throughout the narration), but comparing the two works would be like comparing apples and pears: they have similar textures and flavor profiles, but in the end they are different fruits that possess different forms. I consider the novel to be one-of-a-kind. Charlie, the protagonist, is one of the most vulnerable, raw, real, and honest literary characters that I have encountered within the realm of young adult fiction (and arguably, all genres of fiction). The novel is one of the few instances in which readers have the opportunity to witness the uncensored perspectives of a male character who is not afraid to share his thoughts and sentiments. As of now, it has been the only book that has been capable of making me cry. True, I read the novel during a vulnerable time: like Charlie, I was lost, and confused, and I was looking for someone to speak to. Charlie, the protagonist of the novel, ultimately became that person. But, even when reading Perks numerous times after escaping my own period of vulnerability, it still continues to “listen” to me, and to speak to me. It still continues to haunt me. And every time I read it, it says something different to me. The film was superbly acted by Emma Watson as the vivacious and complex Samantha, and Logan Lerman as Charlie, the film’s heart-breaking and fractured protagonist. Overall, the film has received very positive reviews. It currently has a score of 8.4/10 in IMDB, and it was certified as a fresh film in Rotten Tomatoes, with a current approval rate of 86% among critics and 95% among audience members. And in all honesty, those who don’t understand the movie, or that consider it another bland coming-of-age story either fail to sympathize with the hurdles that the protagonist had to overcome, or they find it hard to connect with the notion of being an outsider (after all, not everyone is aware of the unique perspective that one develops when “standing on the fringes of life”). In due course, the film left me inspired, and it pushed me to submit an article that I wrote on the novel last semester to the ALAN Review, the nation’s leading journal on the study and teaching of young adult literature. Frankly, I had reservations in terms of submitting the article for review, mostly because I feel like I cannot effectively do justice to my favorite novel of all time. In addition, I am aware that the article is far from perfect. However, just like Charlie had to learn how to participate, I needed to step out of the shadows and take an academic risk. I have no idea whether or not the article will be accepted for publication, but I guess there was no harm in trying. Anyway, to conclude today’s post, I will include an excerpt from the article that I submitted. Wish me luck! Although Perks is certainly considered epistolary in terms of its form and delivery, its content and function are definitely attuned towards the aims of developmental fiction. Given that the protagonist depicts his own developmental process through his writing, and given that the novel is written via a series of letters, it is imperative that the reader becomes attuned to how the process of writing and the process of Bildung work together to fulfill and challenge the nuances of development within the literary scope. The process of writing in Perks manifests primarily in two ways: through the letters that Charlie writes to the anonymous recipient and through the assignments and tasks that he completes for his English class in high school. Fascinatingly, Charlie’s writing is very much reflective of his own development as a person, and the writing that we encounter in the first letters of the book is more scrambled, disorganized, and “immature” in comparison to the prose found in his final letters. After Bill’s recommendations, Charlie’s letters increasingly avoid the use of run-on sentences, and his prose becomes much clearer and more efficient, saying more using less words. It is also interesting to note that when Charlie writes about the books that Bill assigns to him, he manages to use writing as a way of evaluating the actions of the characters in the books he reads, and he always tries to establish parallels between his own life and the “life” portrayed in the books. This notion of comparing and contrasting becomes important in terms of the content depicted in Charlie’s letters, for it is in this instance that he begins to situate himself more prominently in the actions that are represented in the letters. At first, most of what he writes about is concerned with the observations that he makes of his family. This notion of writing “empirical” observations of the people he observes becomes the main focus of Charlie’s letters until Bill begins to notice that Charlie constantly stares at people and scrutinizes them obsessively. He then asks Charlie what he thinks about when he observes people, and after he tells Bill everything he thinks about, the teacher remarks that although thinking a lot is not necessarily a bad thing, “sometimes people use thoughts to not participate in life” (Chbosky, 1999, p. 24). This remark pushes Charlie to further assess his own life and the degree to which he participates in events, talks with other people, and tries to make friends. However, the very process of writing his thoughts obliges him to become introverted and pensive, and he continues to write letters as a way of assessing his own life: “when I write letters, I spend the next two days thinking about what I figured out in my letters. I do not know if this is good or bad” (Chbosky, 1999, p. 28). The effort that Charlie puts in trying to understand his meditations is a clear indicator that Bill was right to some extent, for so much effort is put into trying to understand, that there is little room to actually live and enjoy life. Despite the mental effort and time required in the crafting of his letters, there seems to be a radical shift in terms of the content being portrayed after Bill warns Charlie about the perils of overthinking. The focus of the letters shifts from a focus on family to a focus primarily on Charlie’s efforts to socialize and make friends. In due course, Charlie becomes very close to a group of seniors at his school, known for not being the most popular and loved people within the premises. The first friend he makes in high school is Patrick, a gay senior with a penchant for jokes and mischief, and who introduces Charlie into the world of drinking, smoking, and the unwritten rules of sexual behavior. He also befriends Sam (short for Samantha), who is Patrick’s stepsister and on whom Charlie develops an obsessive crush. The bulk of the letters depicted after this point discuss the differences that exist between Patrick, Samantha, other friends, and himself, his strivings to understand the motivations behind their thoughts and actions, and more importantly, the arduous process of integrating himself with Patrick and Samantha’s circle of friends. Charlie develops a clearer sense of the world through this arduous process of integration, and through his immersion in new experiences such as drug use, masturbation, visits to the Rocky Horror Picture Show, and through his exposure to different literatures. His analysis of the content of his letters, and the feedback he gets from his essays at school, demonstrate that Charlie is developing the ability to make his writing more concrete and understandable due to the fact that he is undergoing experiences that provide him with a substantial analytical platform. Even more so, Charlie’s development of his writing prowess leads him to the discovery of the craft he wants to hone as a professional endeavor: “I have decided that maybe I want to write when I grow up. I just don’t know what I would write” (Chbosky, 1999, p. 46). Although at first the letters prevented him from participating due to their introspective and slightly amateurish nature, it is when Charlie combines his writing skills with the experiences that he has obtained that allows him to develop a richer image of who he is and who he wants to be. Interestingly, the more Charlie writes, the more he understands himself, and the easier it is for the recipient of the letters to develop a more defined snapshot of Charlie’s mind. In other words, the more Charlie begins to understand himself, the more others also begin to understand him. It is important to note that in this instance, Charlie is using writing for a new purpose: rather than using the letters as a means of interpreting himself and his world, he uses writing as a way of distancing himself from his thoughts, as if writing were a way of draining his worries away from his mind. Even more so, it is through looking back at his own writing that he is able to comprehend how he loses innocence, and how he is able to understand concepts that used to escape his cognizance. It is after this point that Charlie becomes a “rebel” in many aspects: he begins to smoke and drink more than ever; he begins to explore his sexual identity by hanging out more often with Patrick and kissing him every so often, and he secretly offers his sister assistance when she believes she is pregnant. Charlie begins to realize that life does not have to be lived according to others’ expectations, and if he is to achieve any degree of happiness, he has to find a way to balance his desires and social demand. This stepping away from society’s parameters also manifests within Charlie’s writing, seeing as he begins to experiment with different styles of writing and of conveying ideas: “I wrote a paper about Walden for Bill, but this time I did it differently. I didn’t write a book report. I wrote a report pretending that I was by myself near a lake for two years. I pretended that I lived off the land and had insights. To tell you the truth, I kind of like the idea of doing that right now” (Chbosky, 1999, p. 128). Thus, rather than complying with a formula or a set of rules on how to tackle his literary interventions through writing, he delves into an experimental endeavor in which he filters the information he decodes in the book through his own set of experiences. Rather than simply being a sponge that absorbs and regurgitates ideas, Charlie begins to view the act of writing as a mediation between a conversion taking place, turning him into an active writer rather than a passive one. Thus, the parallels between emotional and mental development, or Bildung, become increasingly tied to the act of writing throughout the progression of the novel. Furthermore, notice that Charlie seems rather pleased with this new direction that he is taking. And rather than replying to her accusations with words, Charlie approaches Sam and starts to kiss her. They soon end up on the bed, kissing passionately, but just as they are about to go all the way, Charlie begins to have a nervous breakdown. To make a long story short, Charlie slowly but surely remembers the fact that he was sexually abused as a child by his diseased aunt Helen, which explains why Charlie was so repressed and had difficulties participating in life. After a few months in the hospital after his breakdown, Charlie begins to come to grips with his repressed past, and he proposes to move on and change the direction of his life. […] Indeed, the surprising and unprecedented moment in which Charlie reawakens his repressed past is indeed heartbreaking and difficult to tolerate emotionally, but it is the moment in which Charlie truly begins to feel free from the unbearable burden of trying to figure out why he is the way he is, and why he so desperately craves to understand the world around him. And although action leads him to achieve his moment of breakthrough, it is the act of writing that helps him put his life into perspective, and that provides the missing puzzle pieces that complete the image of the self. Thanks! You should definitely try to watch it if you can! I also loved “The Giver.” Such a deep and meaningful book. I am keeping my fingers crossed in terms of the article that I submitted! I absolutely loved your interpretation of “Perks” and agree wholeheartedly with your perspective. Emotionally, it was all over the place. There were chill moments, when you could really relate to him on a wallflower level; like when he initially felt out of place and was kind of afraid about starting high school. Then, there were the thought provoking moments, when you had to stop reading and do an introspectively analysis of what was going on with you at that point in your life –Was I thinking too much? Was I participating?– And finally, there were the up and down heart-wrenching moments, when he broke down emotionally in front of Sam (WOW!! ), ultimately having a nervous breakdown, remembers his molestation and reveals his thought processes on dealing with and getting past it to move on with his life. Wow!! I am surprised my book survived the flood of tears that overtook me towards the end. I mean, you knew something had happened to him. I was initially thinking a violently abusive dad, when he talked about his dad having hit him. Then, to learn it was his so loved and missed deceased Aunt Helen…every Saturday…oh my goodness… it was just too much. Thanks for your awesome and thoughtful reply, Tanya! In my opinion, there are two kinds of great books: those that change the literary landscape, and those that provoke intense reactions because they tap into buried truths. I think Perks strangely falls into both categories in my opinion. Its style is very different to most literary texts out there, and simultaneously, it forces you to take a look at your own life and the choices you’ve made. I think at one point or another, we’ve all been wallflowers. The challenge is learning how to participate, but at the same time, realizing that not everybody has to participate in the same way (if you get what I mean). I am currently reading a book that I’m sure inspired Perks, both structurally and thematically: Daniel Keyes’ “Flowers for Algernon.” It is an extremely popular novel and its easy to see why. If you haven’t read it, I suggest that you do so immediately!